Tom Sykes is lucky enough to live in the land of the pinkfoot. He gives some top tips on how to chase the wildest goose of all. The best position for an ambush is between the roost abd feeding ground. The dictionary states that a ‘Wild Goose Chase’ is a “foolish and hopeless search for or pursuit of something unattainable,” which can sum up a lot of goose flights. However, I have a few tricks up my sleeve to even the odds on what is one of the most magical shooting experiences in the UK. I’m very fortunate up here in north west England that we get a mass migration of the most wild goose of all, the pinkfoot. They usually arrive towards the end of September from their summer breeding grounds in Greenland and Iceland and stay throughout the whole season, with birds moving on down south and fresh birds coming in. Once a few birds are here, the chase can begin. Unlike a lot of my other fowling, I tend to travel very light when flighting pinkfeet on a marsh. My usual gear includes gun, cartridges, wading stick, goose call, binoculars and a trusty dog. I usually chase the geese on a morning flight, trying to intercept them from the mudflats out in the bay where they roost and the inland field where they feed during the day. The roost and the feeding ground will vary throughout the season, but the ideal situation is to find a position somewhere between the two. You can be in with a good chance as the birds will often take the most direct route. Tides can help determine when the geese are going to venture off the roost in the morning; a small tide around flight time can help push the geese off. The tide can also force the geese to waddle across the mud closer to the gutters we shoot from. This can mean that they don’t have the distance to gain altitude before crossing the marsh, resulting in a higher chance of a shot. A lack of tide often results in the geese sitting undisturbed on the mud, especially when they have been feeding throughout the night under the moon. On morning flights, when the moon has been up through the night, it often pays to keep an eye out back towards the inland fields as it can be surprising how many bunches can sneak back out quietly onto the marsh without giving away their presence. These birds can often give a good chance of a shot as they can be reducing altitude quickly to join the others out on the mud. This can happen when there isn’t a moon, but usually later on in the flight, often if they have been shot at inland. As well as good tide, I like a good wind. Geese have a tendency to flight out of range on a calm day. A strong wind forces them to fly lower to the ground, which keeps the bird in range and hopefully allows for the greatest chance of a shot. The wind direction, relevant to the location, can alter their behaviour. A strong tail wind will reduce the height of the geese, but will also help accelerate them, making for some very challenging fast shooting. A head wind can reduce the speed dramatically, making them a slower target that will take only a little lead. Some wildfowlers opt for old-school “big guns,” but the main thing is to always travel light when you’re after pinkfoot. 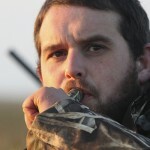 Range estimation is a crucial part of wildfowling in general, but a must when flighting geese. Most people will look at a 60-70 yard goose and believe that it’s no more 30-40 yards due to the size of the target and no landmarks to give perspective. 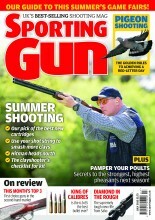 I have seen shooters empty a gun into a high skein and rattle a bird many times, which isn’t what the sport is about. A lot of clubs will have a goose silhouette set up near the sea wall to show what a goose should look like at 40 yards. Geese take a lot to bring down cleanly, the sheer amount of feathers, down, skin, meat and bone the pellets have to penetrate before they get to the vitals is unbelievable. A common mistake when shooting geese is when people use the body as a target. I was always taught to treat the head like a mini clay, thus striking the bird in the head and neck and giving a greater chance of a clean shot. When it comes to height, if in doubt, don’t shoot. Gun choice also needs to be taken into consideration. I personally, like most modern fowlers, choose to use a 3½in chamber 12-bore. There are plenty of people out there that still favour the old “big guns” and I too am partial to a shot with our muzzle loaders. However, with the lead ban and the limited suitable non-toxic shot it can be a costly choice. The average semi-auto, or pump-action in my case, has plenty of stopping power when shooting geese at suitable ranges. I shoot Gamebore 3½in mammoths, which I can’t fault and at under £1 a shot they don’t break the bank either. 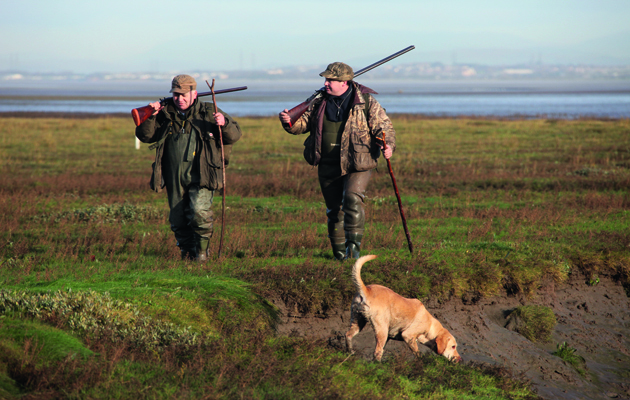 Calls are an essential piece of kit when flighting geese. It’s amazing just how much they can work when geese are slipping wide of a position. However, they don’t always do the job and they can be the pet hate of other fowlers, listening to a man in a hole trying to call every goose that leaves the mud, so it pays to only use them when they will work to avoid being thrown in the drink by a grumpy fowler. Large skeins of geese will normally not take the slightest notice of a single goose call, but smaller bunches just might. The best birds to concentrate on are the singles. These birds are usually lost from the bunch and are frantic to rejoin a group. Quite often they will be fooled to come over for a look and can often produce a shot. Despite best efforts it still comes down to pot luck, I have been out when the conditions are all wrong and shot geese and I’ve been out in what I consider to be perfect conditions and not fired a shot. Either way, being out on the marsh, whether the geese are in shot or flying miles away in the distance, it’s still a fantastic way to spend the morning.